A leading slugger of the 1930s, Zeke Bonura was “one of baseball’s best-loved figures.”1 He was a colorful first baseman with an indomitable spirit, and his great enthusiasm resonated with fans. In seven major-league seasons, he hit .307 and averaged 100 RBIs per season. During World War II, he received the Legion of Merit medal for creating baseball fields and leagues in North Africa, enabling service men and women to play and watch the national pastime. 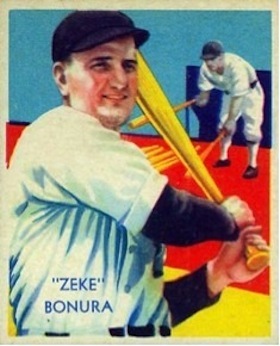 The Cleveland Indians invited Bonura to spring training in 1930. He hit the ball well but was awkward playing first base,8 so the Indians returned him to the minors. He batted .352 for the Pelicans in 1930 but missed much of the season with a leg injury.9 In 1931 he played for both the Pelicans and the Indianapolis Indians. For the next two seasons, Bonura starred for the Dallas Steers of the Texas League. On July 17, 1932, he clouted a home run and two doubles, and drove in seven runs in Dallas’s 9-8 victory over the Beaumont Explorers.10 He batted .322 in 1932, and his 21 home runs placed him third in the league behind Beaumont’s Hank Greenberg (39) and Houston’s Joe Medwick (26). The next year Bonura hit .357, led the league with 24 home runs and won the league’s MVP Award. In both 1932 and 1933, he led Texas League first basemen in fielding percentage.11 He was ready for the major leagues and was acquired by the Chicago White Sox. “I’m on third. I see [Jimmie] DeShong, which is the New York pitcher for the Yankees on that day, take his windup. He makes the mistake of taking a long windup and I’m off third like a bird. Now you understand there was no signal for to steal. I’m using my head and being alert. DeShong has got himself all wound up like a clock now and here I’m breezin’ home as though carried by some winged horse of some name or other. A newspaperman wrote a swell story about it back home. It sounded like Pegasus. In fact it was Pegasus because I looked it up thinkin’ at first he was ribbin’ me. In 1936, Bonura was an offensive force on a fourth-place White Sox team. He hit only 12 home runs, but he batted .330 and achieved career highs in RBIs (138), runs scored (120), and walks (94). Sure-handed in the field, he again led major-league first basemen with a .996 fielding percentage. The White Sox finished in third place in 1937. Bonura’s offensive numbers were again stellar: a .345 batting average, fourth highest in the league, with 19 home runs and 100 RBIs. He was a holdout in the spring of 1938, the fourth consecutive spring in which he held out, and this time White Sox owner Louis Comiskey refused to meet his salary demands and traded him to the Washington Senators. During the first two-thirds of the 1938 season, Bonura was mired in a slump. His batting average through games of August 3 was .232, but then his bat caught fire: From August 4 to August 27, he hit .476 and knocked in 37 runs in 23 games. He finished the season with a .289 average and led the fifth-place Senators with 114 RBIs, and his 22 home runs set a franchise record. But in mid-September, with the Giants languishing in fifth place, Bill Terry decided to bench Bonura to give playing time to Babe Young, an impressive rookie. Bonura led the Giants in batting average (.321) and RBIs (85) in 1939, but Terry felt that Young was his first baseman of the future. Bonura did not respond well to the benching; according to Terry, he “sneered and sulked.”41 In April 1940, the Giants traded Bonura back to the Washington Senators. On June 29, 1940, Bonura doubled in the eighth inning with the bases loaded as Washington overcame homers by Ted Williams and Bobby Doerr to earn a 9-7 victory in Boston.42 However, Bonura’s productivity at the plate was declining, and the Senators sold his contract to the Chicago Cubs in July. He was elated to return to Chicago, but his hitting did not improve. His major-league career came to an end in February 1941 when the Cubs sold his contract to the Minneapolis Millers of the American Association. In 1944 Bonura organized baseball in the south of France.49 The Army released him in October 1945, and he returned to New Orleans. He hoped to resume his playing career in 1946, but no major-league team was interested in a slow-footed, 37-year-old first baseman. Bonura managed several minor-league teams from 1946 to 1954, and was a playing manager until 1952. At age 42, he hit .404 in 48 games for the 1951 Midland (Texas) Indians of the Class C Longhorn League. Hank Greenberg, now general manager of the Cleveland Indians, hired Bonura in 1953 to manage the Fargo-Moorhead Twins, a Class C affiliate.50 Under Bonura’s guidance, the Twins won the Northern League championship. Eighteen-year-old Roger Maris batted .325 for the team. Bonura died in New Orleans on March 9, 1987, at age 78. He was posthumously inducted into the National Italian American Sports Hall of Fame, the Louisiana Sports Hall of Fame, and the Texas League Hall of Fame. Steven R. Bullock, Playing for Their Nation: Baseball and the American Military during World War II (Lincoln, Nebraska: University of Nebraska Press, 2004), 50-56. Gary Bedingfield, “Zeke Bonura, Spreading Baseball Around the Globe,” When Baseball Went to War, Todd Anton and Bill Nowlin, eds. (Chicago: Triumph Books, 2008), 63-69. Wanda Ellen Wakefield, Playing to Win: Sports and the American Military, 1898-1945 (Albany, New York: State University of New York Press, 1997), 88-90. 1 Lethbridge (Alberta) Herald, November 24, 1945. 2 St. Louis Post-Dispatch, April 23, 1934. 4 Battle Creek (MI) Enquirer, May 19, 1929; St. Louis Post-Dispatch, August 2, 1934. 5 New Orleans Times-Picayune, July 6, 1925; www.usatf.org/statistics/USA-Champions/USAOutdoorTF/men/JT.aspx. 6 Shreveport (LA) Times, January 8, 1935. 7 Shreveport Times, February 10, 1930. 8 Indianapolis Star, March 23, 1930. 9 Shreveport Times, August 3, 1930. 10 Shreveport Times, July 18, 1932. 11 Brooklyn Daily Eagle, November 13, 1933. 12 The Sporting News, August 23, 1934. 13 Brooklyn Daily Eagle, October 28, 1934. 14 Detroit Free Press, September 3, 1935. 15 Brooklyn Daily Eagle, July 28, 1935. 16 St. Louis Post-Dispatch, June 11, 1937. 17 Cincinnati Enquirer, January 20, 1940. 18 Brooklyn Daily Eagle, February 3, 1935; Shreveport Times, January 21, 1935. 19 Lubbock (TX) Morning Avalanche, December 30, 1932; Philadelphia Inquirer, March 6, 1938. 20 The Sporting News, April 27, 1939; Boston Globe, June 29, 1939. 21 Philadelphia Inquirer, June 2, 1937. 22 Shreveport Times, June 30, 1937; Cincinnati Enquirer, March 18, 1939. 23 Shreveport Times, July 15, 1937. 24 Battle Creek Enquirer, August 13, 1937. 25 Detroit Free Press, August 13, 1937; Philadelphia Inquirer, August 14, 1937. 26 Philadelphia Inquirer, March 15, 1938. 28 Detroit Free Press, April 20, 1938. 29 Brooklyn Daily Eagle, March 26, 1938. 30 St. Louis Star-Times, December 29, 1938. 31 Cincinnati Enquirer, January 4, 1946. 32 The Sporting News, July 8, 1959. 33 Philadelphia Inquirer, November 17, 1939. 34 Brooklyn Daily Eagle, July 29, 1938. 35 The American League adopted the designated hitter rule in 1973. 36 Brooklyn Daily Eagle, March 8, 1939. 37 Walter M. Langford, Legends of Baseball: An Oral History of the Game’s Golden Age (South Bend, Indiana: Diamond Communications, 1987), 109. 38 Cincinnati Enquirer, May 27, 1948. 39 Boston Globe, June 29, 1939. 40 Pittsburgh Press, April 11, 1939. 41 The Sporting News, February 15, 1940. 42 Cincinnati Enquirer, June 30, 1940. 44 Lincoln (NE) Evening Journal, June 25, 1941; Cincinnati Enquirer, October 21, 1941. 45 Lincoln Evening Journal, May 17, 1943; The Sporting News, September 23, 1943; Yank Magazine, October 15, 1943. 46 Detroit Free Press, September 24, 1943; Philadelphia Inquirer, October 4, 1943. 47 Pittsburgh Press, January 7, 1946. 48 Indianapolis Star, October 23, 1943. 49 Louisville Courier-Journal, October 14, 1944. 50 New Orleans Times-Picayune, September 25, 1953. 51 The Sporting News, March 23, 1987. 52 New Orleans Times-Picayune, December 22, 1967. 53 The Sporting News, April 13, 1955. 54 Cincinnati Enquirer, January 4, 1946. 55 New Orleans Times-Picayune, September 3, 1967.